AKIPRESS.COM - Uzbekistan, a country of a little over 30 million people, topped the men’s ring medal table at Rio 2016, with seven medals overall, just edging out the legendary Cubans who finished with six medals, reported the Boxing News Online. Boxing is a very popular sport in Uzbekistan and the men have won four Olympic gold, two silver and eight bronze medals. Not a bad medal haul, when one considers that Uzbekistan only competed in its own right as an independent republic at the Atlanta Games in 1996 – where a bronze medal was secured – quite big strides in a mere 20 years then. There is an even more impressive medal haul in the men’s World Championships, which Uzbekistan first entered in Tampere, Finland in 1993. Since then, no fewer than 30 medals have been bagged: five gold, 10 silver and 15 bronze. Their first gold medal was won in the Sydney Olympics in 2000 by light-welterweight, Mahammatkodir Abdoollayev, while, light-middleweight, Karim Tulaganov having won their first Olympic boxing medal, a bronze in Atlanta in 1996. Two bronze medals were also gained in Sydney. 2004 in Athens produced two more bronze medals, while disappointingly there was a ‘nil return’ in 2008 in Beijing. Another single bronze was forthcoming in London 2012 and then a medal explosion followed in Rio in 2016. 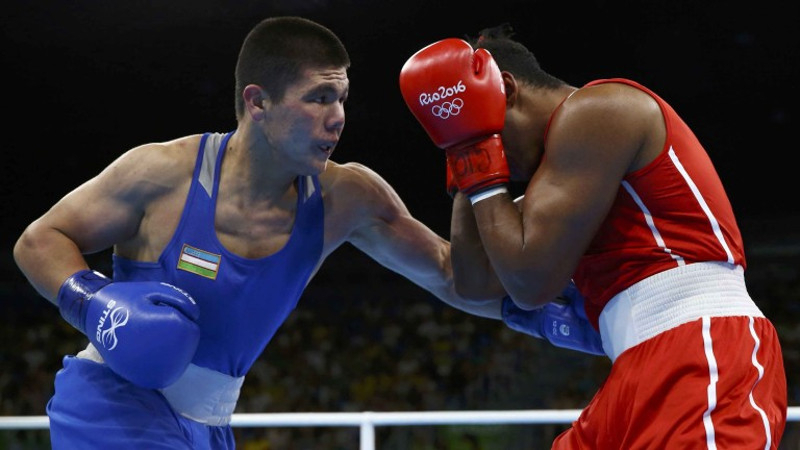 Uzbekistan was making its statement at the Olympic Games and notably in the boxing ring.